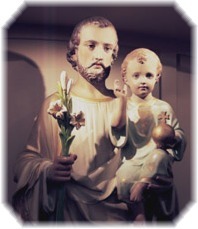 The feast day of St. Joseph is celebrated on March 19 every year. St. Joseph's Day is a Roman Catholic feast day commemorating the life of St. Joseph, the step-father of Jesus and husband of the Blessed Virgin Mary. People with very strong religious association, often those of southern Italian descent, typically celebrate St. Joseph's Day. March 19 is said to be St. Joseph's birthday. During a famine in Sicily, when food was scarce and many people were starving, the poor people had only their faith to rely on. St. Joseph was known as the protector of the Holy Family and Italians had strong family relationships, so they prayed for St. Joseph to intercede for them so they could have successful crops. Their prayers were answered, and the famine came to an end. In gratitude, people promised to make annual offerings of their most precious possession – food – in St. Joseph's honor. Today, the faithful erect "St. Joseph Tables," which are set to honor St. Joseph. They are filled with beautiful and often elaborate foods, including meatless dishes such as stuffed artichokes, pasta and fish, as well as breads, cookies, pastries, cakes and other delicacies. Each table is blessed by a priest and presided over by a statue of St. Joseph. A stalk of lily blossoms, votive candles and a lace tablecloth are other typical items used to decorate the feast table. When you visit a St. Joseph's table, you often receive gifts of fava beans and breads. Fava beans play an integral part of the celebration because this was the food that saved the Sicilians from starvation. The bean is said to bring good luck, and it is believed that if the St. Joseph's bread is kept in the home, the family will never starve. Photograph on this page Copyright © Paul Flores www.stjoephoto.com. The St. Joseph's Table - In Italy Online (www.initaly.com) presents a historical overview of St. Joseph's Day along with a description of many of the holiday customs and traditions.